CEO Ed Colligan was interviewed by Swiss newspaper Sonntagszeitung at the 3GSM conference in Barcelona regarding Apple’s upcoming (June 2007) iPhone. “In my opinion it looks rather like a highly developed media player, which happens to include a phone,” Colligan said. Apple has supplied “nothing at all” regarding iPhone to date, according to Colligan. There’s a huge difference between giving a keynote speech and actually developing and shipping the devices, Colligan said. Full article (in German) here. Yes, the iPhone will be interesting for people who like music and films and occasionally use the phone. Keep telling yourself that, Ed. Maybe it’ll just go away (along with some other things). Only intelligent thing he said. Of course that’s what Ed would say – that’s what his stockholders pay him to say. In fairness, he’s right. The Treos offer a similar (not equal) set of features at a much lower price. Chevy also offers a similar (not equal) set of features as a BMW for a much lower price. However, as far as phones are concerned, the only choice has been Chevy. Now that there is a new gold standard in the mobile phone world, a lot of people are going to “trade up”. As a Treo 650 owner, I am not pleased at all. Palm has non-existent Mac support. I have never, ever, synced up my Treo to my iCal completely. Even using MissingSync. It’s bulky. 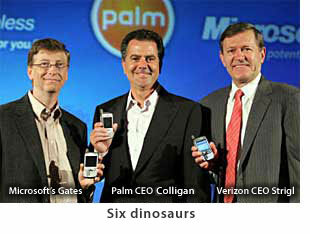 I do like some of the palm programs, like PocketQuicken. GoogleMaps is a great thing on it as well. But, honestly, I’m ditching it as soon as the iPhone is out. Palm is like stuck in 2000. “Six dinosaurs”…. LOL… that is awesome! A man who knows little or nothing about his competition and what differentiates his company from the competition is displaying profound ignorance and foolishness. Well, Ed, welcome to the sad and inimical world of complacency, insular thinking, and regret, you’ll fit right in. You might have noticed that many of your friends have already arrived. Eric... here's a solution to your sync problem. I’ve got the treo 700p. It’s nice, and does a good job, for a bit old clunky looking hand held. The syncing was a hassle for me also with my phone and my boss’. If you’re using missing sync, you have to deselect all of the palm conduits in the missing sync program, then it works ok. (just unclick the box next to everything that has the palm logo next to it in the missing sync prog, boot missing sync without the phone plugged in. )Just figured that out the other day. Guess where I got the right info? not the palm website, or the palm customer support line, or even with the email customer support with missing sync. I got it at the genius bar of my local apple store. I just can’t bring myself to use cingular again. I’d love an iPhone, but the worst customer service experience of my life was with ATnT, and I’m not going there again. I’ll wait until it releases with other carriers… 2-3 years is what the cingular people are telling me.